The taller the ceiling, the more wall space for . . . . .well, that's the question. How many pictures should you hang on a wall that's approx 14 ft wide by 20 ft tall? We couldn't answer that question either. It really comes down to the overall scale of the room. We thought maybe a set of 3 large framed pieces would be right, but finding a set of three compatible pieces of art proved to be a difficult task. And on second thought, would something so flat really fill in that large space. 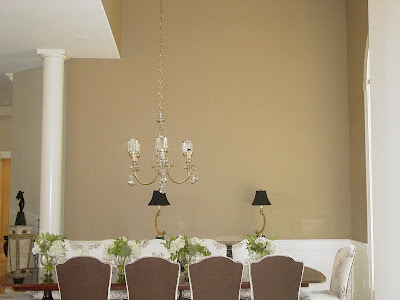 With a beautiful arched window to the right, and several columns to the left, we needed something with a little more "heft". We did proceed to draw the wall and art pieces to scale (with our handy dandy computer program, Minutes Matter Studio). That quick rendering was just what we needed to go ahead an place the order. If you've ever been in our shop, you know we don't have the wall space to keep these sizes in inventory! Since size was so important, we searched for art that could be purchased in custom sizes. This one is approximately 50" wide X 70" tall. 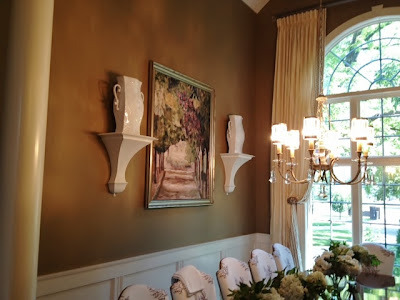 We were able to get a frame with just enough detail to blend with the decor, but not overwhelm the beautiful painting. Thanks to Krista at If Walls Could Talk, that was the easy part. 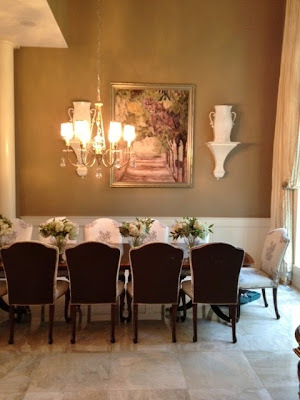 I found out that transporting the framed piece to the client's home was the hard part! A closer look at the brackets/shelves we used to hold the vases. The white-on-white look was just the right addition to the colorful piece of art. Everyone approved of the final results. Walls don't have to be big to be boring. Call us for an appointment.